Here’s a wordy song about musical stardom with one of the most well-known strumming intros of the era. Mr. Jones uses a clever minor progression in A minor that changes to C major for the chorus. The chords are pretty simple, just pay attention to the variation in progressions. 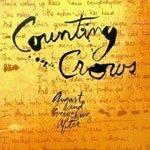 Counting Crows aren’t all that attached to the same order every time. A down, down, up, up, down strum with heavy swing will get you the rest of the way there. "She's looking at you. Ah, no, no, she's looking at me." "She's looking at you. Uh, I don't think so. She's looking at me." We All want to be big, big stars, but we got different reasons for that.